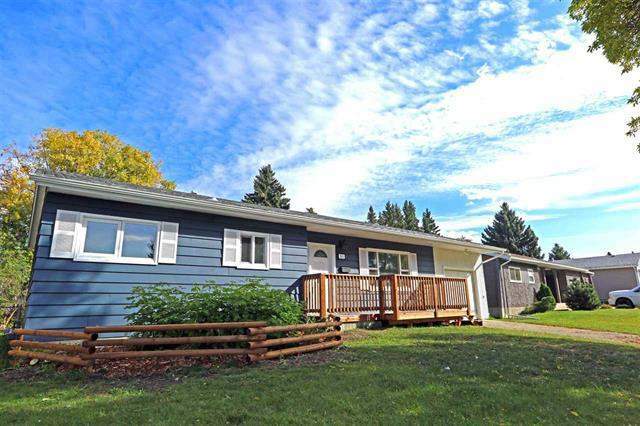 Located in the heart of Sherwood Park, this updated home offers proximity to parks, schools and even major shopping including Sherwood Park Mall. You'll love the peace and convenience Sherwood Park offers, while being able to commute to the city in no time! The home itself features a brand new exterior paint, a new front porch, and tons of new interior renovations! Plus, there's a massive backyard, an attached single car garage and updated windows throughout! Walk inside the front door and be greeted with neutral paint tones, new vinyl plank flooring and tons of natural light. The front living room blends together with the dining space and then opens into the massive renovated kitchen. This open concept design is perfect for entertaining or just relaxing! The kitchen boasts an enormous amount of brand new white cabinetry complimented perfectly with granite countertops. A large island, dual basin sink and white appliances including a full size fridge, stove, microwave and even a dishwasher finish off this bright and functional kitchen! Down the hallway you'll find a large master bedroom, with enough space for any furniture set and plenty of closet space, along with two more bedrooms and a renovated full bathroom. The basement level if fully finished and offers an additional bedroom, a den space, another massive full bathroom and enough space for an office or play room! A laundry area, and a furnace room complete this awesome basement level. Don't miss out on this wonderful, renovated bungalow! Call today to schedule a viewing!